He had cult hits with Trainspotting and 28 Days Later; now Danny Boyle is tipped for Oscar glory. Adopted as one of our local heroes, Danny Boyle helped put Scotland on the Cool Britannia map with his witty, stark portrayal of heroin addicts in 1996 film, Trainspotting. Now, with such well-received silver screen successes as The Beach and 28 Days Later under his belt, Lancashire lad Boyle is set to go superstar-stellar with his latest outing, Slumdog Millionaire. Indeed, film pundits are all a-fluster that Boyle may be a hot contender at the upcoming Oscars. Following it’s opening in North America, Slumdog slammed the box office, with numbers revealing it to have the highest opening numbers for a speciality picture of 2008, out-grossing Clint Eastwood’s Changeling in some theatres. Directed by Boyle and written by The Full Monty writer Simon Beaufoy, the film stars Skins actor Dev Patel as Jamal Malik, an 18 year-old orphan from the slums of Mumbai, who is just one question away from winning a staggering 20 million rupees on India’s Who Wants To Be A Millionaire? Initiated at Film4, who co-developed and co-financed the film with UK production company Celador Films, the film was acquired by Pathé at script stage. To date, the film has won the coveted audience award at the Toronto Film Festival in September and closed the London Film Festival in November with a standing ovation. More recently, it was named best film by the National Board of Review (the first major prize of the US film awards season), named best picture at the British Independent Film Awards as well as pocketing BIFA awards for best director, and most promising newcomer for Patel. 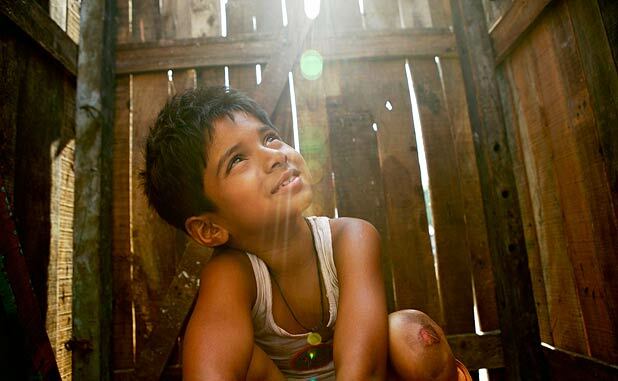 Slumdog Millionaire is out on general release from 9 Jan. See the next issue for an interview with Danny Boyle.